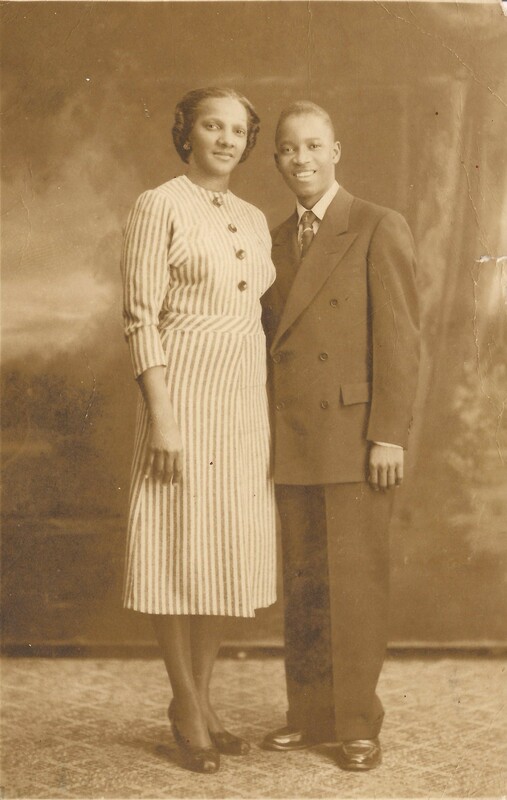 Mr. Elmer Linzey and his aunt Mrs. Maude O.Edwards who were the founders of the Saba Electric Company while they lived in New York. Finally this month the tree made good on Elmer’s promise. I called his wife Edwina Linzey (born Illidge) and informed her that Elmer’s tree had finally flowered. He had brought the seed from Hawaii where he had been attending a conference of his beloved Lions Club. The small seed which he brought back produced a large tree in less than no time. I had planted the slip in the same spot where a flamboyant tree had been. The flamboyant was from seed which I had brought back from the grounds of the Governor’s residence in Kingston Jamaica in 1976. However the tree never bore any flowers as Elmer had guaranteed that he had seen in Hawaii. When Elmer enquired about the status of the tree I informed him that it was already that big that he could bring a hammock and sling it in the tree and take a siesta anytime he wanted to. After all it was his tree. Every hand while when I am travelling I dream something or the other about Elmer. We take the dreams of the place where we live and the people we know with us. Wherever I am my dreams are from the islands. I have this recurrent dream that I am walking up the old Front Street of my youth with no cars around and I get lost in between the former old mansions. In that dream there is never a person in sight and it is always at night. I did not know Elmer when I was growing up. He was some years older than I. By the time I went to The Bottom to school in 1953 and 1954, Elmer had been living in New York by his Aunt Mrs. Othella Maude Edwards born Jackson. 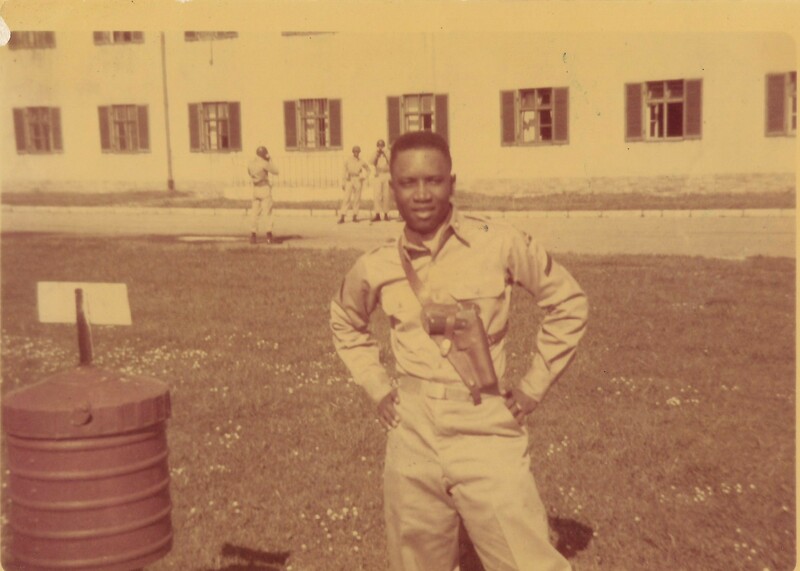 He had even served in the United States army in the war of the Korean Peninsula. He did not get there but served in Germany. He went to South Korea to attend a Lions Convention many years after the war. The poet tells us that “Man does not live by bread alone, but by the lyrics of poets, the wisdom of sages, the holiness of saints, the biographies of great souls. “ My friend Elmer was a great soul and I will attempt at paying tribute to him in this short biography. Elmer Wycliffe Linzey was born on Saba on August 28th, 1933 and died in New Jersey on January 1st 2007. I not only did the eulogy when he was buried but also a speech on January 11th, 2002 when the GEBE power plant at the Fort Bay was named in his honour. I will quote from those and other speeches and times when I spoke in honour of my friend Elmer. The first time that I had a confrontation with Elmer was also the last time as we became fast friends after that. It was 1973. I had won the elections in 1971 convincingly but not allowed to hold office because the “powers” that be kept me out of office by a false interpretation of the Islands Regulations. From right to left. 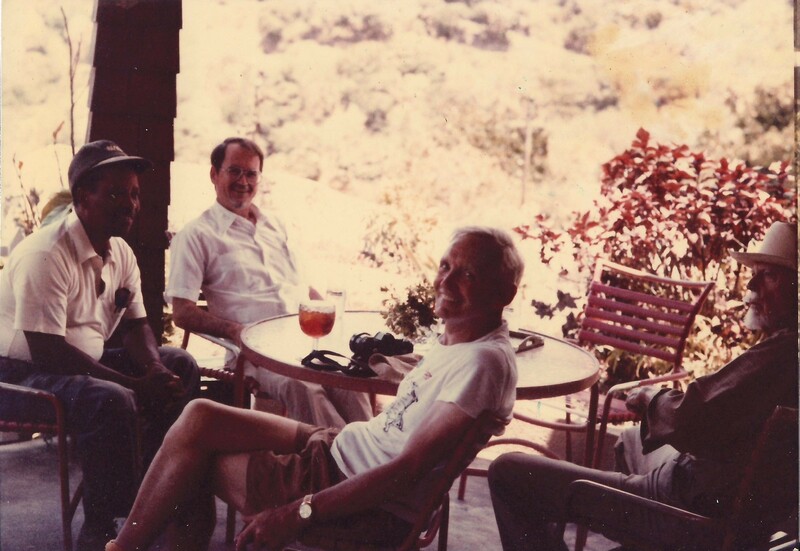 George Seaman, writer, Jack Lincoln head of civil aviation of Great Britain, Elmer Linzey and me, Will Johnson. Lion Elmer speaking to me then Act. Governor and my wife Lynne at a Lions event. Elmer served in the U.S. army during the Korean War and was stationed in Germany then occupied by the allied forces, Russia, England, France and the United States. When we dedicated the power plant in Elmer’s name in my speech I made some statements which are still relevant today. November 8th, 1972 the new power plant at Fort Bay, then part of N.V. GEBE. “It is remarkable how life has changed in one or two generations. 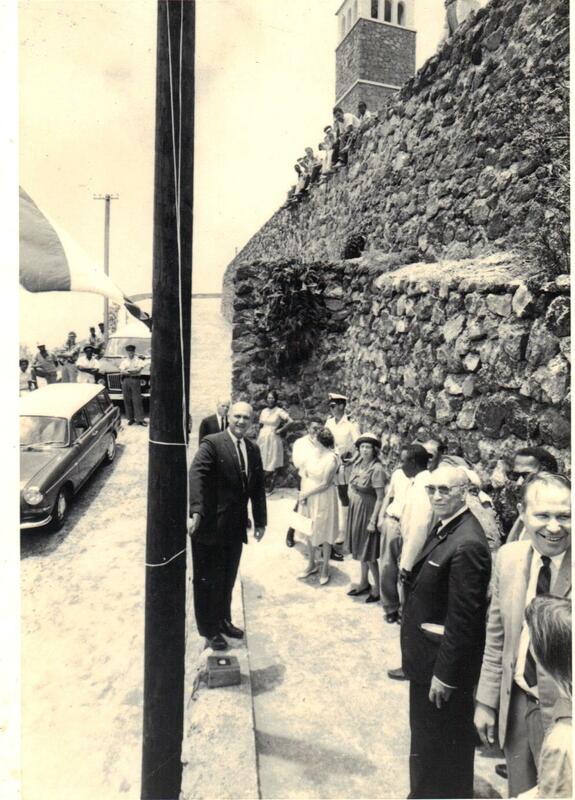 My grandfather James Horton Simmons used to be called on by the government, along with the rest of the able bodied men on Saba, once a year, to clean the Kings Highway. That grand name was given to a road little more than a goat path. For this he received two cents in cash money or the equivalent in rum or tobacco. The rest of the year he had to struggle to survive from the land and the sea along with 2500 other people who lived here at the time. My father Daniel Thomas Johnson was a government foreman. When he could find work he was paid fls. 2.50 a day. He would leave his home at Behind-The-Ridge at 5am, after first having fed his livestock, and he would come with his oil lantern down to the Fort Bay road to put in a full eight hours of work. When he died at the age of 64 in 1972 he did not have an old age pension and had never made more than f. 99.—a quincenna with government. Most people make as much in a day now as my father made in a month. The hard labour of our forefathers has repeatedly been under attack. Not only attacks from the elements, but also from human destructive forces, which are always breaking down while others are trying to build up. We are still being confronted with those of parasitic tendencies whose sole mission are to break down in words and deeds, the work of others while not being able to demonstrate anything tangible which they have done. Lt. Governor J.J. Beaujon and Minister Plenipotentiary Wim Lampe taking part in connecting the village of Hell’s Gate to the electricity grid. The first engine for Saba Electric Company was accompanied by Elmer from New York, via Trinidad and Curacao and on arrival at Saba fell overboard into the sea. The Sabans got together strapped it with ropes and dragged it out of the water. After a good cleaning it went into service for the next thirty years and was then retired. I recall one day sitting with a friend of mine at Scout’s Place. She was a cousin of the Rockefeller family. When Elmer came to join us he spoke so familiar to the lady that I remarked. “It seems that I don’t have to introduce you two.” She laughed and said: “I know Elmer when he was a young man coming down from New York with his first engine. She and her deceased husband had been on the same ship as they loved freighter travel. And then Elmer went on to tell the story of how when he got to Saba after going via Trinidad and Aruba and so on, that the engine fell overboard while being landed at the Fort Bay here on Saba. It did not stay in the water for too long. 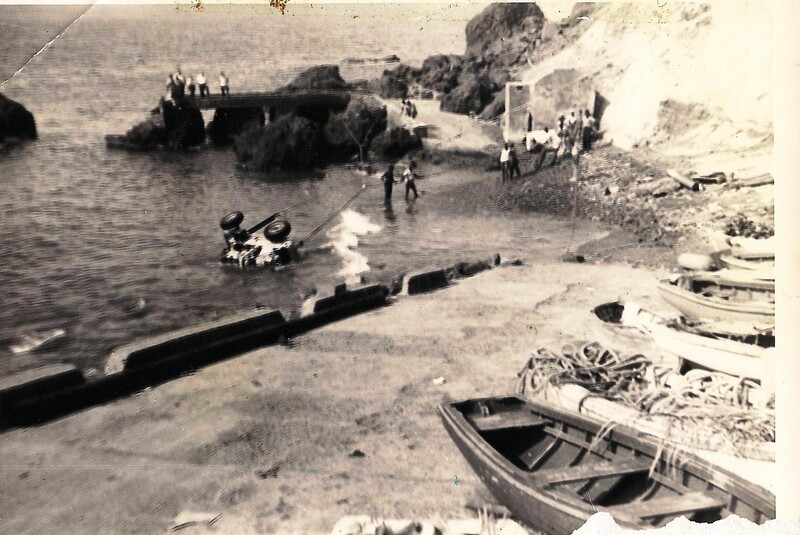 The people of Saba got together, lashed the engine with ropes at the bottom of the sea and towed it in to shore. The engine was overhauled and worked for the next thirty years. Elmer was more or less forced to sell the Saba Electric Company so that the Federal Government could form the GEBE Company to serve the three Windward Islands. He served as Manager of GEBE Saba until he retired. After that he was appointed as a Member of the Board of GEBE. During that time he made sure that Saba was upgraded. He also felt strongly that the company should never be split up. He also had a long career in the Lions Club. 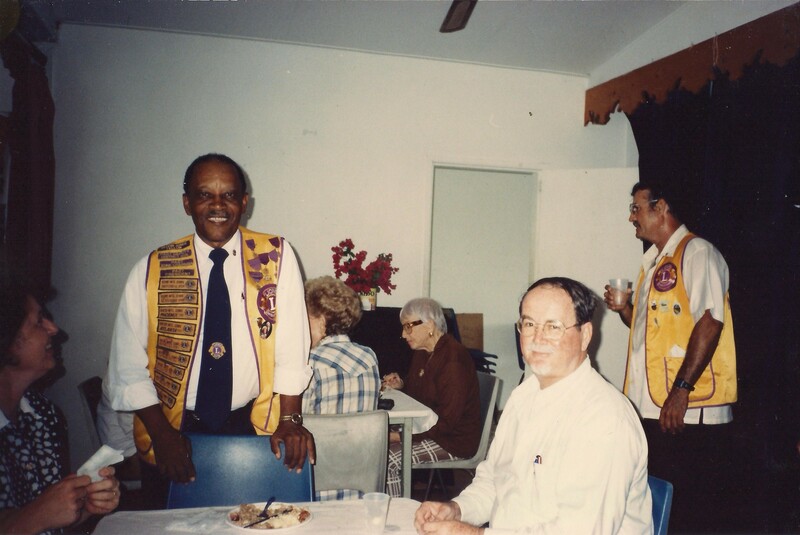 He was District Governor for the Caribbean region and received many awards. His years of service to the Saba Artisans Foundation and the Saba Conservation Foundation, I will speak to his years as a pioneer and a patriot. He served with me on the Island Council for eight years. I remember when we lost the election in 1987. I was at Scout’s Place and he came in all enthusiastic and excited. I reminded him that we had lost the election. He said: “Will where have you been? We have won all five seats on the Island Council. You are good for four and with me on board the two of us count for five.” And with that upbeat assessment the mood changed around and we set out to govern the island from the opposition benches. At least we made so much noise that in later years newspapers on other islands wrote that one never got the feeling that I was in opposition but rather running the government all the time. 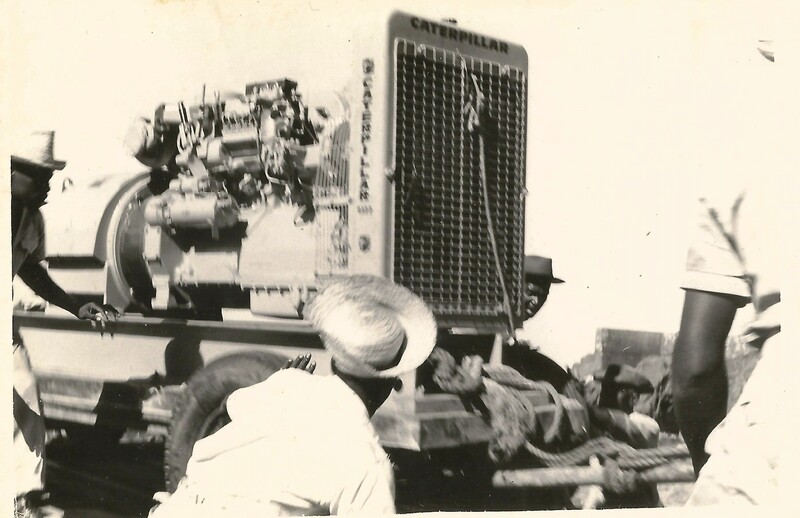 The engine which went into the sea being loaded for transport to Crispeen where the first power plant was located. The man helping from behind the engine is the former Commissioner Matthew Levenston. Elmer Linzey was indeed a pioneer.” But the work of the pioneer is always costly. He builds the road and he suffers the travails of road building; but very often he does not reap the full reward of his work. We shall come to where the cross-roads meet. Yeah, birthright in the land of covenant. For us a day labour travail of the soul. Is not one thing on us alone bestowed? 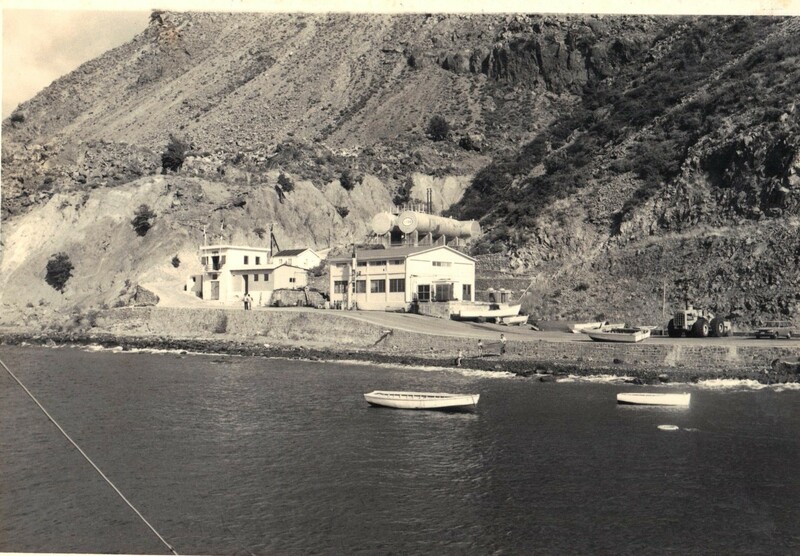 Before the Saba Electric Company was established everything was done the hard way. 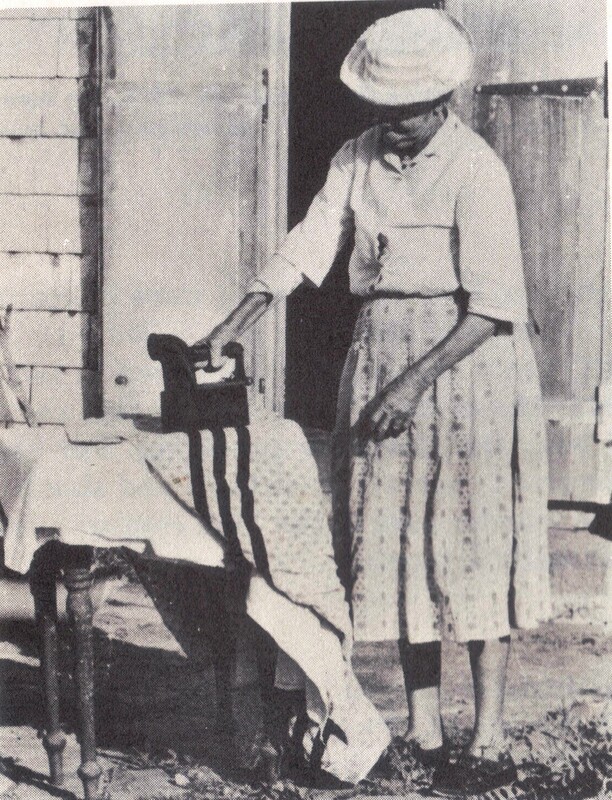 The lady here is ironing the old fashioned way. The goose was loaded with coals. So Elmer Wycliffe Linzey, pioneer and patriot; Man of wisdom and integrity; Man of dedication and achievement; Man of destiny. National Hero. We salute you and we shall always remember you, great hearted friend and comrade of the way, valiant and courageous soul, we commend you to God’s keeping until the day breaks and the shadows flee away. Since this article was written several years ago there have been major changes. The participation by Saba in GEBE N.V. came to an end and Saba’s shares in the company were bought out. The Government of Saba on my advice went back to the original company the Saba Electric Company N.V. A new power plant is being built on an elevated situation on the road leading to the Bottom. The new location is far enough from the sea which in past hurricanes did much damage to the engines at the power plant. Most of the power cables are now underground and the old electricity poles are all being removed in the villages and along the road. A magnificent new Office of the Company has been built in The Bottom. New engines are being ordered and the future looks bright for the company, with plans for a solar system and possibly wind power. Elmer would have been happy to see all this taking place as this was all part of his dream for Saba. Rest softly brother Elmer. Rest softly.